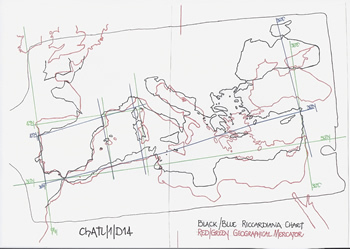 Some 25 years ago during one of many visits to the old Map Room on the 3rd floor of the British Library (tucked away in the back corner) I happened upon the first volume of “History of Cartography”. Only being enthusiastically interested in maps I was not following the latest texts, but merely researching for my own interests as I had a copy of the Thames and Hudson Portolan book. But when I viewed HOC/1/C19; “Portolan Charts from the late 13th century to 1500”, and read the introductory paragraphs I was struck by the language used; it seemed to me they were words of persons who actually did not understand the implications of such definitive adjectives and were oblivious to the gross errors within these charts and many other early maps that I had observed. The first paragraph states;” To the historians of late medieval and early modern European cartography the Portolan Charts are fundamental documents, if mysterious in their origin and precocious in their precision. Their importance has long been acknowledged, and “The First true Maps” was the enthusiastic title of an article by Charles Raymond Beazley in 1904. 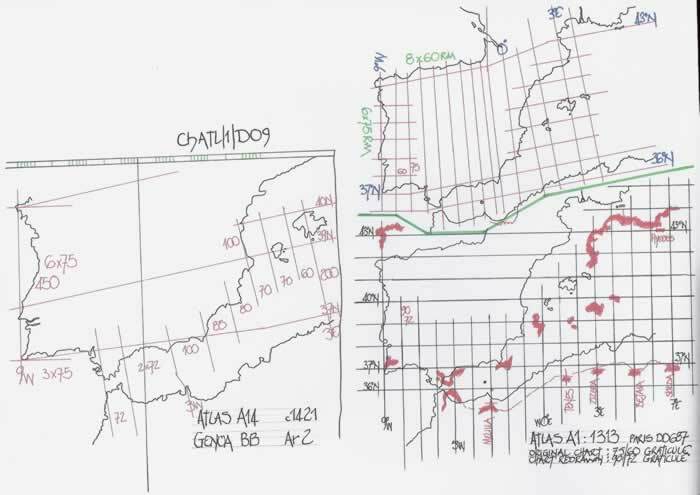 More recently, Armando Cortesao considered the “advent of the Portolan Chart…… one of the most important turning points in the whole history of cartography”. Alberto Magnaghi went further, describing them as a unique achievement not only in the history of navigation but in the history of civilisation itself. For Monique de la Ronciere the work of the first named practioners, Pietro Vesconte, was so exact that the Mediterranean outline would not be improved until the eighteenth century. 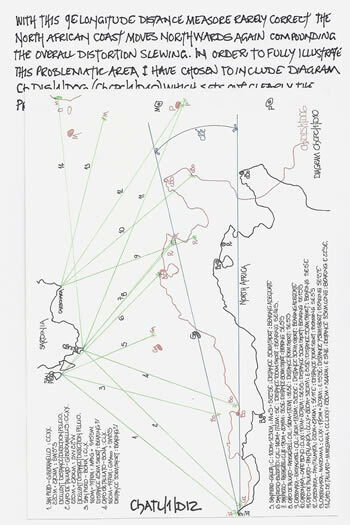 In terms of the economic history of cartography, Vesconte and his contemporaries may have been the first, in the plausible opinion of a recent writer, “to pursue map making as a full-time commercial craft”. Before continuing I think it is pertinent to state clearly that I consider these “paintings” to be beautifully drawn and presented in a manner which elevates them to a level commensurate with the “old masters” of the art world. They are visually stunning and a joy to behold, but the adjectives used are actually inaccurate and I considered likely to mislead other researchers as later texts by researchers tend to prove. Having been employed in a practice where, “accuracy, precision and exactness” were everyday necessities, my own basic research, before I read HOC/1/C19, showed quite plainly that there were large distortions within the Portolan Charts and maps of the era, even though if you twisted them about you could obtain a pictorial fit if you kept the scale of the charts and geographical map small enough. 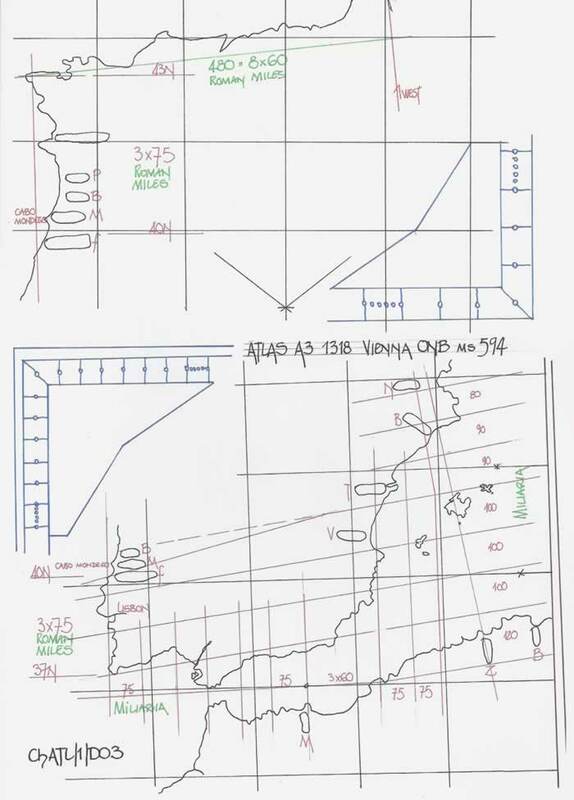 It should be clearly understood that if these Portolan charts were compared full size, that is probably over a metre /3 feet and even 4 feet in length then the so called fit would be shown to be anomalous. Thus by keeping the comparison maps small, the above “exact” comments were able to be made but they were still basically flawed. I also doubted that they could be used as sailing charts, and therefore navigation with them was probably a non starter as the distortions meant that there was no correct area upon these charts that accorded with the actuality of NSEW, except the west coast of Iberia. Thus I started a full examination of these charts and early English maps to establish what they actually represented and how they were constructed. But I feel that the text I have just quoted must be questioned in light of my findings. Precision; exactness and accuracy. Precise; definite, exact, not vague, just the right amount or measure. Exact; precise, exactly correct or precisely agreeing, strictly correct, accurate in detail, unambiguous. Accurate; done with care; exact; correctness. Thus over the years I have endeavoured to correct these superlatives used by searching out the inner workings of both maps and charts (as well as ancient geographical treatises) to establish where they may be considered acceptably correct, where they deviate and why? But more importantly, where did the original data come from to enable them to be drawn? From that research I concluded that, beautiful as they may be, they are actually very flawed in their internal construction. These flaws are basic errors which I believe can be traced back to Roman measurements as used on their original maps and medieval man’s complete misunderstanding of basic measurement. As I have shown in previous texts, just because a measurement is called a “MILE”, it certainly need not be and in most instances is not the same as the next measurement just because it is called a “MILE”. Hence between the end of the Roman period in the 5th century to the beginning of the 13th century the Roman Mile of 8 stadia morphed into the Millara by the ratio of 5:6, such that a degree of latitude containing 75 Roman Miles or 600 Stadia changed to the new measurement of the Millara which were 90 per degree latitude. Thus in fact they should have had 6.667 stadia in each and again 600 per degree of latitude. But of course 90 Millara was then taken as having 90 x 8 stadia = 720 stadia per degree, which by the 15th century because of the Strabo/Eratosthenes text where their degree was given as 700 stadia the 90 was reduced to 87.5 millara to comply. Utter nonsense of course, but par for the course by medieval man, no understanding and no method of confirming any such measurement! This is the main failing by the draughtsmen of these maps and charts. Thus I decided in this text to set down once and for all the basic problems of Portolan charts as exemplified in the Atlases from 1313 to 1434. I have included, as stated previously, from each of the 14 examples the chart of the Iberian Peninsula, the arbiter of the Portolan Chart distortions. In previous texts I have clearly noted this fact, stating that the west coast of Iberia is always drawn due north/south thus agreeing with the Windrose setting out. From this point I have clearly shown the latitudinal deviations, their tortuous journey east on the wrong lines. 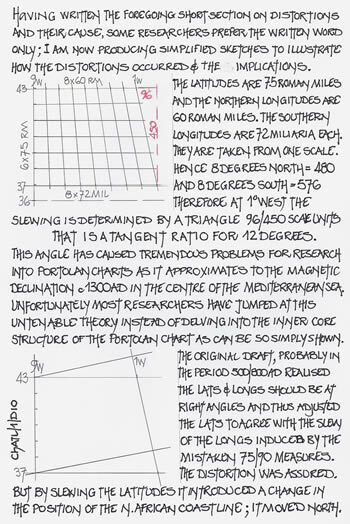 I will therefore plainly state, yet again, that the “de rigueur” usage of “magnetic declination” to account for the slewing anti-clockwise and the “bandwagon” effect of researchers endeavouring to portray various distortions on Portolan charts as a result of the “magnetic declination” has done more to stop proper fundamental research than the hyperbole used in the HOC text, and that is bad enough! I have yet to read a text which proves my thesis wrong regarding these matters, and more to the point actually proves how the compass could have been used to construct a chart. 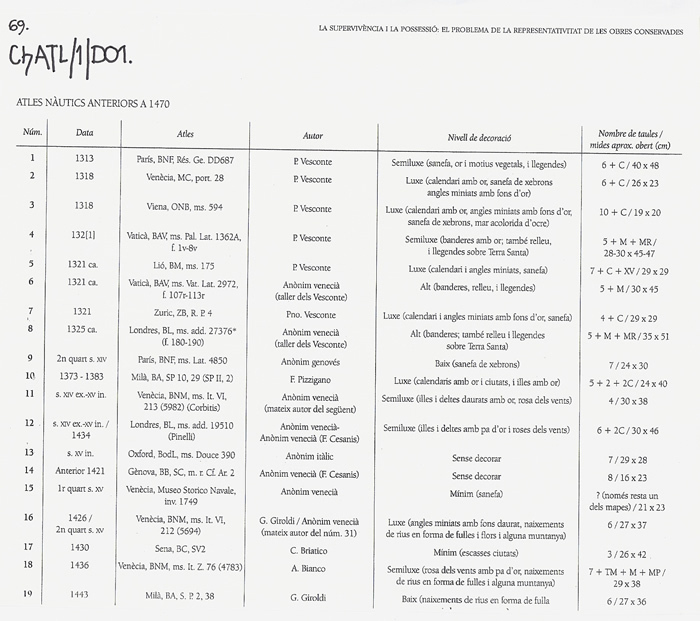 Thus the following 8 sheets containing the 14 Atlas charts will now be simply discussed, firstly to indicate the continuing distortions there-in, which as you will read has lasted well over 100 years, and still continued for at least 2 centuries after, and then a definitive section is added to set down the distortions and their effect upon the charts. To ensure that the Atlases being used are properly identified I include part of page 69 from Les Cartes Portolanes which details them and their origination as per Diagram ChATL/1/D01. Being the earliest extant Atlas and drawn by the supposed first cartographer, Petrus Vesconte, it is a prime example of the knowledge circa 1313. That knowledge can be shown to emanate from a map of Iberia drawn using the Roman Mile as its basic measurement, but was poorly adjusted to suit the new measurement of the Millara at sometime in the previous 600 years. Hence the northern and western coasts are clearly Roman Mile distances and the southern/eastern coasts are millara measurements. Thus we can also assume that Petrus Vesconte had no idea of the actual distance measures of the Iberian Peninsula, he was copying by rote. But, by a pure mathematical function as both the Roman Mile measure of 75/degree and the Millara measure of 90/degree are taken from the same scale bar, the east becomes 20% larger than the west inducing a massive distortion into the chart which continues across all the sheets of the Atlas as previous text ChPV/1 has clearly illustrated. This problem pervades all 14 atlas pages and thus will not be explained again. The Iberian Peninsula is incomplete on this one sheet, but easily evaluated for its measurements. Thus the western seabord by the scale bar measures 400 units, and as such gives 6 degrees of 66.667 units each. This is an unknown measurement, but mathematically is actually 10 units of the 6.667stade per Millara, but drawn as 400 Millara. But a simple check on the southern and western coasts indicates the scale bar could well be mis-drawn. I have included a revised scale bar, (the double distances are noted) and if those units are used it is quite plausible the distances are meant to be 75 Roman Miles and 90 Millara, the original intention no doubt. But I discuss this possibility and others at the end of this text. The Iberian Peninsula is split into two sheets in a rather curious manner, as one part, the south, has a scale bar 9/16ths scale of the northern part, but the same towns and Cabo Mondego are noted on each, which aids research. Had the northern part been drawn to the same scale it would have made for a far easier usage by persons interested in the whole Iberian Peninsula? Needless to say, the latitudes in the west are 75 Roman Miles and in the north the longitudes are 60 Roman Miles. But, south and east they revert to Millara measurements of 90 and 72 respectively. Iberia is shown as one landmass on this sheet and exhibits what is now the standard format; west/north = Roman Miles; south/east = Millara. Here again we perhaps find a faulty scale bar with the west coast from Cape St Vincent to Cape Finisterre being 400 units, but by amending the scale bar it can be shown in all probability to be a drafting error. Other distortions appear upon this sheet such that Millara distances in the south appear to revert to Roman Miles, i.e. 72 to 60. Another atlas with a dubious scale bar which if revised as the diagram illustrates shows an amalgam of Roman Mile and Millara distances. This chart with the west coast of Iberia having a latitude of 400 units, has a longitude in the north of 480 units, i.e. 8 degrees of 60 Roman Miles, but apply a revised scale bar and that becomes 560 units or 8 x 70 which is probably 8 x 72 = 576 units and Millara. 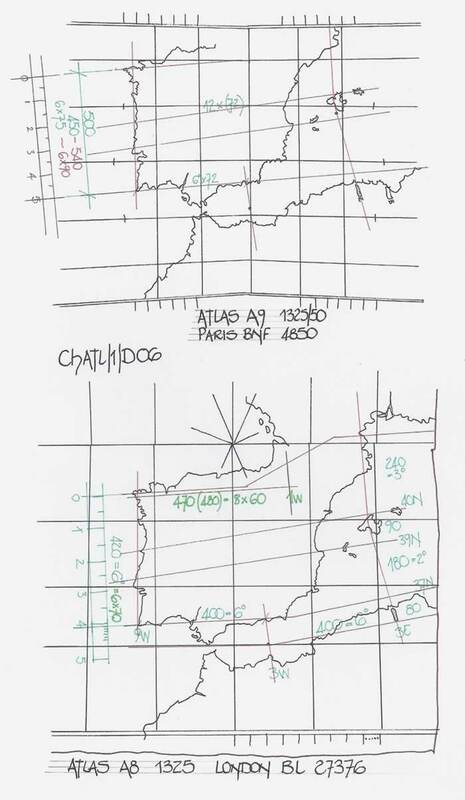 It would appear that there are two distinct templates for these Atlas pages such that the confusion between the west coast latitudinal measurements causes great difficulty for the draughtsmen who do not recognize the errors and copy by rote. Whether this is from a single original which was mis-copied or a plain mistake is open to question, but obviously points to a basic lack of knowledge. Curiously this chart has 6 degrees of latitude at 400 (420) units and then also longitudinally two sections of 6 degrees each of 400 units. In the north it is a standard 60 Roman Mile longitude measure, but in the south the longitude is 66.667 units. However in the east the latitudes are 90 Millara and thus a very strangely drawn Iberian peninsula appears. Given the rather small scale chosen for this page of the Atlas, Iberia measures 500 units latitudinally, which unfortunately is basically the mid-point of 6 x 75 = 450 and 2 x 90 = 540 units. However longitudinally from 9W to 3W it is 6 x 72 millara. A standard, (by now), portrayal of Iberia with Roman Mile measurements to the west and north and Millara measurements to the south and east. Another standard portrayal of Iberia having Roman and Millara measurement. This atlas page has far more of the Atlantic Ocean and North Africa than previously seen. However, it has the curious measurement of 6 degrees being 400 units both latitudinally and longitudinally interspersed with other rather curious measurements. The chart is such that although it illustrates so much, the basic layout errors preclude making amendment to the scale bar in the hope of establishing and actual basis for its draughtsmanship. But, it does reflect the obvious lack of knowledge of these copyist draughtsmen who cannot resolve the problems through lack of real data, and possibly the knowledge to use it. This chart returns to the standard format with Roman Mile measures west and north and Millara measures south and east. Exhibiting the standard format it shows no deviation from the tried and tested plot. Included now is an example shown firstly in text ChPV/1 of the distortions caused by the use of two distinctly different measurements but using the same scale bar. Thus the two, 75 and 90 are at variance by 20% and the west coast is reduced in latitude compared to the east coast. 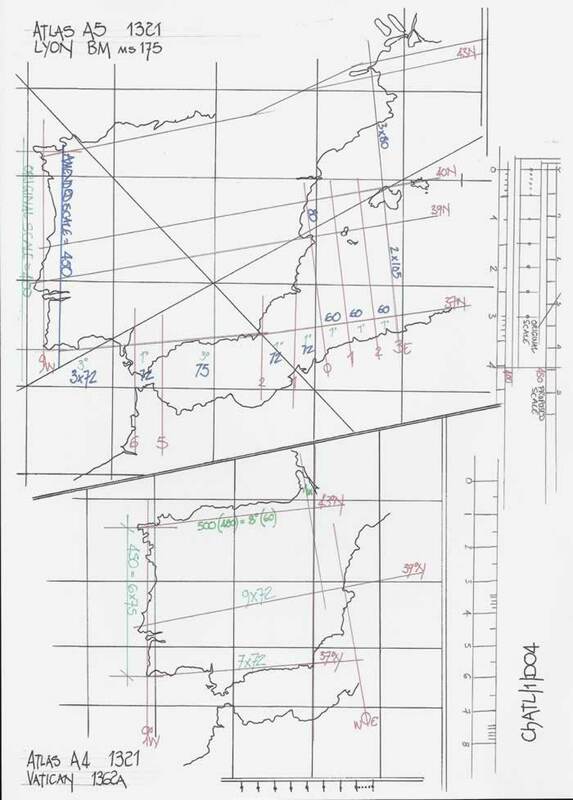 The revised plot included here-in, drawn on a 90/72 graticule indicates clearly the errors built into this atlas page by this mis-measurement and thus the complete distortion of the following atlas sheets and of course a full Portolan Chart. It must be quite plain to all readers of this text that these Atlases are copies of copies, probably a single master Atlas which was mis-copied to produce a sub-master having the variant 400 unit latitude measure for the western seabord of Iberia. But it appears that not one of the medieval copyists has realised the implications of the two measurements differing by number, but in fact being the same distance measure expressed in varying nomenclature, Roman Mile and Millara. Thus by using just one scale bar based upon the Millara length of 1.233 KM, with thus 90 per degree of latitude, in drawing latitudinal degrees as 75 units or Millara (when in fact they are Roman Miles), and then longitudes corresponding to the correct proportions at 36N of 60 units (Roman Miles) a completely unacceptable, distorted Iberian Peninsula is drawn. Thus I do not consider these draughtsmen were “cartographers” in the true sense of the noun, but merely copyists, excellent draughtsmen and miniaturists no doubt, but probably not even mathematically competent to recognize the errors they were perpetuating. It is obvious to me that over the +100 years span of Atlas production we can see in these 14 examples, there is no attempt to correct the errors and this also applies to Portolans. A portolan Chart has in its construction a Windrose which is normally drawn on the vellum prior to the coastlines and toponyms being added. The one basic fact which indicates that a Portolan Chart is slewed anti-clockwise is that the Windrose is drawn on the vellum such that it is four-square NSEW with on some charts the main winds being actually named. Winds are determined by their angular bearing to geographic north and thus all sections of a Portolan Chart which are north/south or east/west should accord with the major lines of the Windrose. That this does not happen except in the case of the west coast of the Iberian Peninsula has been adequately shown by the various texts of the website. 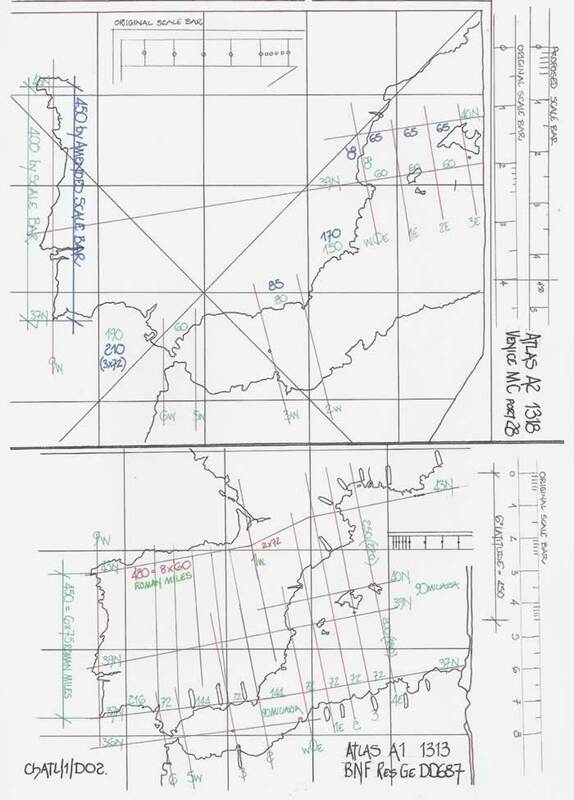 Therefore each Portolan chart which does not exhibit geographical alignments when they should will have a slewing anti-clockwise dependent upon the internal accuracy of the draughtsmanship, which varies considerably, and has been shown to be the root cause of previous researcher’s statements of varying supposed magnetic declinations. They are purely and simply measurement and drafting distortion and they can be explained as follows. The west coast of Iberia is always drawn geographically correct in that it follows the 9W longitude and is thus set north/south and is in agreement with the Windrose. But then the north coast from Cape Finisterre to the French Border at c1W should be set parallel to and near the 43N latitude. 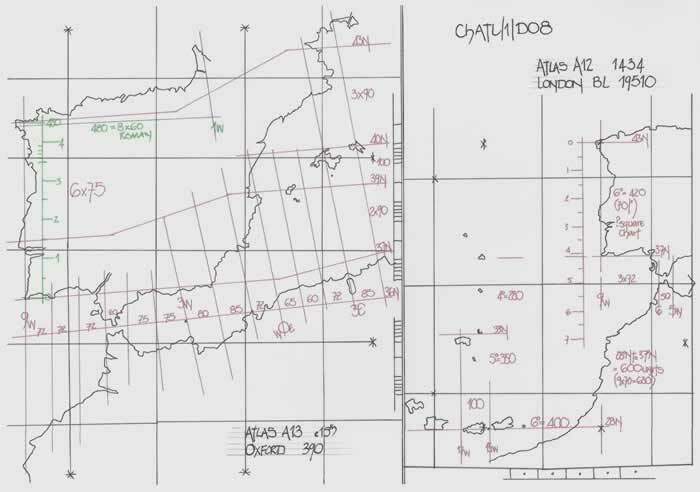 The southern coastline in a general sense from Cape St Vincent to Carboneras (adjacent to Punta de los Meurtos, and north of Cabo de Gata; qv D16) should follow the 37N latitude, but neither aligns as expected given the correctness of the west coast alignment. In fact they are slewed anti-clockwise, with the 37N latitude sometimes only marginally slewed such that at times it may be considered nearly correct; the 43N is likewise sometimes nearly correct but both can be drawn up to 12 degrees slewed. Thus the previous comment about a variation in the supposed magnetic declination change was born. If we now look at the scale bar and assess the distances they portray for the Iberian Peninsula, a surprising feature is revealed. The scale bar appears to be a basic 50 unit division with sometimes 200 or 400 unit length. But measure the distance from Cape St Vincent to Cape Finisterre, that is from 37N to 43N, and the reading is immediately suspect. The scale bar appears to be set out as Millara, but that distance measure is 450 units which produces 6 degrees of 75 units and is a degree measure in Roman Miles not Millara which should be 6 x 90 millara, or 540 units. 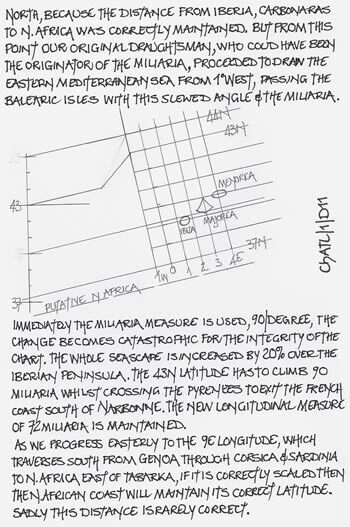 Hence the first discrepancy arises; if the scale bar is Millara then the Iberian Peninsula is drawn 20% smaller latitudinally on the west coast than its Millara measurement to the east. If a distance measure check is then made for the eastern seabord, and through the Balearic Isles, then the scale bar is definitely Millara and not Roman Miles. Hence this is a major catastrophe for the chart’s integrity inserted via this mis-measurement. Measure the south coastal area from Cape St Vincent to Carboneras and the longitudes are generally 72 Millara each, which would be correct for latitude of 36N proportional to the degree having 90 Millara. If it had been derived from the 75 Roman Mile degree then the proportion is 60 RM. Similarly check the N African coastline and toponym positions and they are equally correct at 72 millara longitude. Now follow the same process on the northern coastline from Cape Finisterre to the French Border, some 8 degrees of longitude and it is generally 480 units and thus 8 x 60 units, the proportion at 36N from 75 units or Roman Miles. Thus these same 8 degrees in the south are each 72 units and if the longitudinal lines are drawn joining the two sets they show a gradually increasing taper or slew anti-clockwise because of the 20% expansion. Now we can assess the reason why the latitudinal lines at 37N and 43N slew. They have been drawn to accord with the longitudinal lines as “everybody” knows the two parts of the graticule are at 90 degrees to each other, and as we have a purely rectangular graticule based upon the proportions at 36N we should expect nothing less to be drawn. But of course, by maintaining the western seabord as true N/S, the knock on effect of this error to the Iberian Peninsula has massive and catastrophic implications for the whole chart. Then, by slewing the 37N line of Iberia northwards it has the effect of pulling the N African coastline northwards to maintain the correct distance from Carboneras southwards. 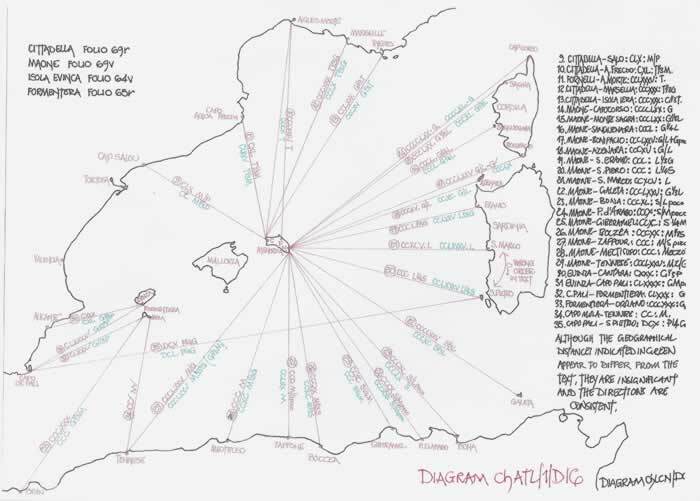 The most important distortion fact for the Portolan Chart now comes into play; the near correct distance is used from Algiers (Zizera) to Majorca and thence to the French Coast between Aigues Morte and Montpellier, using the correct Millara measure of 90 per degree. Thus as we already have a distortion caused by mis-measurement of Iberia latitudinally at 450 units; the east coast is now 20% longer which ensures that the 43N latitude from Cape Finisterre must deviate to cross the French Coast south of Narbonne in the form of a zigzag. 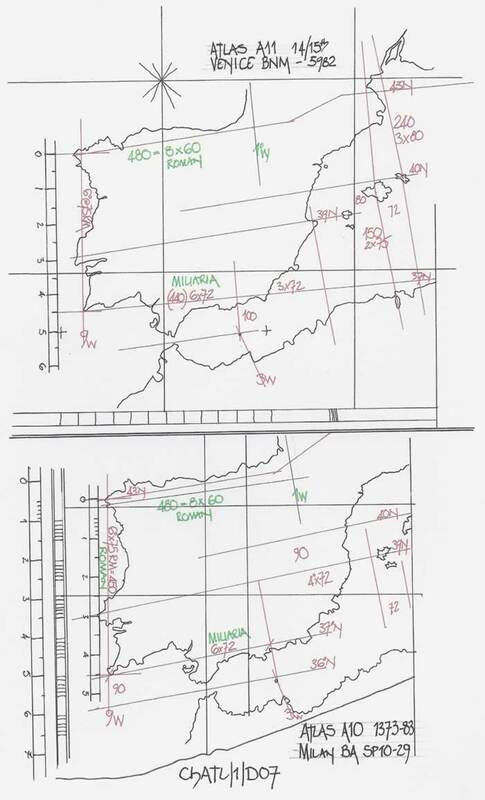 The slewing of a Portolan Chart is thus assured by the squeezed longitudes of 60 units along the north coast of Iberia and the mis-match of the latitudinal measures, 75 to 90. 2) GENOA TO N. AFRICA; 9E LONGITUDE. 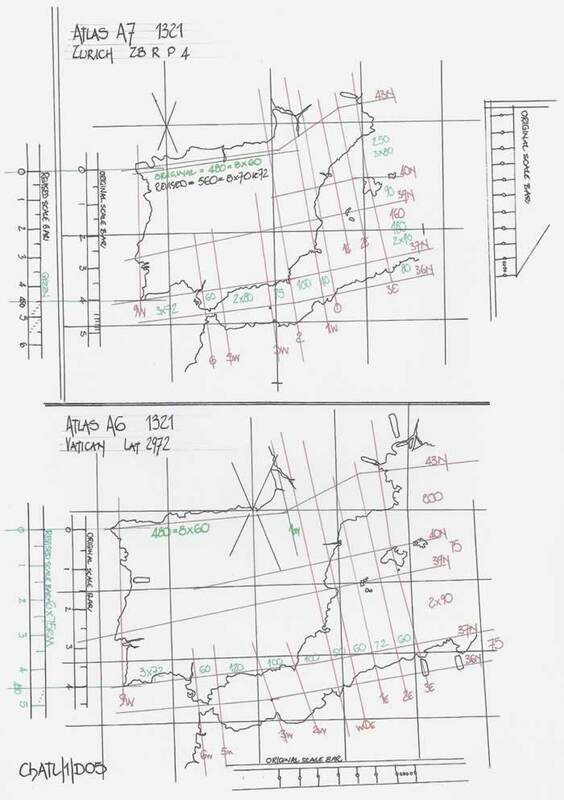 The coastline from Narbonne to Genoa is slewed anti-clockwise and because of the fact that the correct distance measure is applied between the two longitudinal lines, they are parallel to the distorted slewing of the Balearic lines thus ensuring that the 9E longitude is slewed. The 43N latitude passes correctly from south of Narbonne through the Iles de Hyeres to Cape Corse and thence to the Italian mainland. Thus the distance from this line to Genoa is 43N to 44.4N or 1.4 x 90 = 126 Millara, anything else will give yet another positional error and in fact can be shown to be an error on some charts. From Cape Corse southerly to the N African coast near Tabarka following the 9E line it is made up of 4 sections; Corsica, Bouches di Bonifacio, Sardinia and the Mediterranean Sea passing the Iles des Galite. If one error occurs here in this latitudinal distance, if it is reduced, then the N African coastline will be pulled northwards again and the consequential errors noted on the whole setting out of the Italian/Sicilian landmasses occur, and then continuing twists further eastwards. Unfortunately that is the general scenario for a Portolan chart; the distance measure from Genoa to Tabarka is normally reduced, mainly affecting the southern section through Sardinia to N Africa and a greater slewing ensues; remember the Beccari comment! 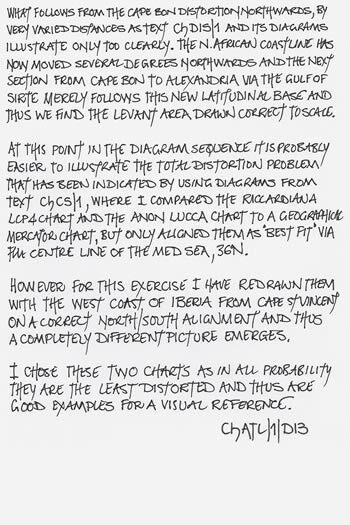 Thus the N African coastline which is generally correct in its longitudinal measurements is moved northwards by two major errors of draughtsmanship and the fairy tale of magnetic declination upon a Portolan chart is born from basic distortion errors. This is perhaps the easiest of errors to discuss. If we commence at Alexandria, 31N/30E and measure to the Island of Rhodes, which is set at 36N (as probably every ancient mariner and map-maker was so well aware,) we find a consistently correct distance measurement. But if we measure from that 36N line northwards to the mouth of the Dardanelles, geographically at 40N we find an increase of 90 millara, one degree of latitude inserted. Thus the whole Aegean Sea is stretched northwards with the Peloponnese and Euboea being oversized to compensate and in the far north “Salonika” is badly mis-placed. This has a consequential effect upon the latitude of Constantinople, it now being at least one degree north of its geographical location. What is hardly affected is the Levant coast of the eastern Mediterranean Sea and the area surrounding Cyprus. As the Aegean Sea is latitudinally enlarged then Turkey/Asia Minor is also enlarged. But, the actual latitudinal distance of the Black sea is acceptable with the Crimean Peninsula and Sea of Azov also correct. However, longitudinally it is a different picture. If the 36E longitude is projected north from the Levant and Mediterranean Sea it generally crosses the eastern portion of the Crimean Peninsula in the correct position. But the overall length of the Black Sea has expanded from 910 millara up to c1040 millara as previous texts have clearly shown. 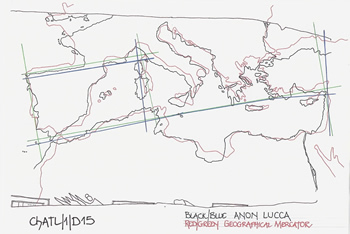 Thus the distortion northwards of the Mediterranean Sea combined with the longitudinal distortion of the Black Sea means that from its western extremity to the eastern extremity, the Mediterranean Sea basin as drawn on portolan charts is completely distorted. This is shown by a correct analysis of the graticules which deviate in some places quite wildly, but, it still produces a very recognisable visual format which has confused researchers for years. The visual representation may be considered a “trompe l’oeil” painting. THE ABOVE TEXT WAS ORIGINALLY WRITTEN IN SHORTENED FORM AS A PREPARATION TEXT AND DIAGRAM ASSISTED EXPLANATION.IT IS NOW INCLUDED FOR THOSE FOR WHOM KNOWLEDGE OF GRATICULES AND MEASURES IS PERHAPS NOT MATHEMATICALLY BASED; IT CONSISTS OF 6 DIAGRAM /TEXT SHEETS WHICH ARE REPRODUCED AS THE ORIGINAL HAND WRITTEN NOTES. The foregoing text has thrown what may be called a “wobbly” into the possible measurements used on Portolan Charts and Atlases. If a latitudinal measurement is drawn as 75 Roman Miles the scale bar can be drawn as Millara; that is the latitudinal measurement is identical just a different base measure of 90 not 75. Thus enters the possibility of other measurements being hidden in the map or charts construction, which if based on the latitudinal measurement will be inter-changeable. Consider the fact that some Atlases have shown that the 6 latitudinal degrees of the western Iberian coast from 37N to 43N to be only 400, 410 and 420 units. The 400 units are 66.667 per degree and as such reflect the subdivision of the Millara when given in terms of Stadia, at 6.667 stadia per millara. But an increase in the measurement taken via the scale bar occurs, to 410 or 420 units and then a different picture arises. Thus 410 units is 68.33 per degree and 420 units is 70 per degree; the 70 units being easily measured from the scale bar. However the latitudinal measurement via the English Statute Mile is 69 Miles and thus the scale bar could reflect this measurement as it is actually the same as 75 Roman Miles or 90 Millara. If we take 70 units per degree the 36N ratio will give 56 units (Miles), which is very reminiscent of the Arab Degree length, and is the longitudinal measures of these Atlases. The English Mile is attested from the Anglo Saxon chronicle, which begins, “The island of Britain is 800 miles long”, and for interested parties I suggest they read Chapter 5, “The Mile and the League” from “The weights and measures of England” by R D Connor. The use of this Mile thus cannot be ruled out and in fact can be shown to be used in later Portolan Chart Atlases without any doubt at all. The measurement could well be a relic from the Norman hold on Sicily and southern Italy and thus transferred northwards. “A mile is not always a mile unless it is a mile”. My original interest was piqued by the Thames and Hudson English version of a French text entitled, “Les Portulans: Cartes marines du XIIIe au XVIIe Siecle”. My copy of the 1984 publication still has its grey cardboard slip cover and is a treasured book; one of many I may say produced by Thames and Hudson. But, immediately I read the text and looked at the photo’s of the charts so well reproduced it became apparent to me there was a considerable problem with the rhetoric and the actuality of the charts portrayal. This text was written by Michel Mollat du Jourdin and Monique de La Ronciere, and is the reason I am using it here-in. They obviously are the persons HOC/1/19 refers to. This of course is from the 1984 text and is now utter nonsense. If a study of the Angelino Dulcert chart is undertaken, the distance measured via the scale bars (numerous) indicates the 6 latitudinal degrees from 37N to 43N of the western Iberian coastline only total 400 scale units. Across the north at 43N we find 60 units per degree of longitude and then the distance measure for 9E is totally awry. Nothing on this chart is magnetic; it is all the resultant of mis-interpreted measurements applied via a single scale bar. And as has been shown this is the basic setting out of the original chart which has later been subjected to so much copying and mis-copying. The whole text of “Sea Charts of the Early Explorers” is predicated upon an idea which appears to have become fashionable in the late 19th and early 20th centuries BUT not one person actually investigated the internal workings of a Portolan chart. Yes, 1984 is over 30 years ago, but why is there no proper academic research? In the text ChLCN/1, I opined that if the draughtsmen of the Portolan Charts had known of and used the text of “Lo Conpasso de Navegare”, particularly the Peleio section for Majorca and Menorca, folios 64-69, then the area of the western Mediterranean Sea which contains those Islands would have been drawn as a correct portrayal of that area geographically. That is, the c12 degree skew caused by the incorrect usage of distance measures for the Iberian Peninsula would have been obviated. The Diagram ChATL/1/D16 (ChLCN/1/D07) sets out the distances as taken from “Lo Conpasso de Navegare” and as can be immediately observed, from Aigues Morte to Cape Fornells, Menorca, that is from 4.2E to 4.13E, noted as Tramontana, CCLXXXV (285) Millara, a geographical equivalent of 310 Millara, is hardly in error given the scale of the charts. Thus there could have been a perfect positioning of the Island, as then from Maone to Zaffour, CCC (300) and noted as Meczo et Sirocco poco, when in fact Azeffoum is at 36 51’N, 4 .43E and as such is virtually south, it could equally be considered a north south alignment from Aigues Morte, with only a longitudinal difference at 36N of 16.5 Millara, which is totally insignificant. Therefore as I have already opined, at one period in the centuries 500 to 1200AD, there was a very accurate map and set of distances either taken from that map or given as a gazetteer list which would have enabled the Portolan Charts to be accurate. Hence, it is also the probable period for the original compilation of” Lo Conpasso de Navegare”. The fact that draughtsmen of extant Portolan Charts were probably just copyists and did not know of the inaccuracies they were copying and therefore had no access to data to correct their charts, if they knew how, is an absolute tragedy. Their work is extra-ordinary; they are “Artists”, “Miniaturists” and purveyors of excellent artefacts and if only they had been proper cartographers with an understanding of the mathematics involved and the scope for the use of latitudes all of the texts written concerning their charts would have been so very different in their content. But did they know about “Lo Conpasso de Navegare”? But surely now we can throw out the concept of magnets, delete such studies and concentrate upon the actuality of a Portolan Charts as illustrated by its internal construction. I am strongly of the opinion that present researchers in universities are mis-leading their students by purveying the ideas of the last centuries; they are incorrect! Here-in I reproduce an email dated 24/05/13, endeavouring not to give the authors identity, but include the text as written. http://www.maphistory.info/portolanchapter.html. In these works you will find the answers to some of your questions and learn many useful things about the way charts were made and used in the middle ages. On the specific subject of influence of magnetic declination, see my article —–. It is not true that the Mediterranean pilots knew about magnetic declination. The first extant source where the phenomenon is referred to is the diary of Columbus, written in 1492. They knew, of course, that the marine compasses did not point always to geographic north. But they usually attributed the fact to ill-made or defective compasses. In ALL portolan charts up to 1600 the axis of the Mediterranean is tilted counter-clockwise about 8-10 degrees. On this, see Lanman (p25) and my thesis dissertation. Charts were made on the basis of magnetic directions observed with the marine compass, not geographic directions, and were supposed to be used EXACTLY the same way. Correcting those magnetic directions would be inconvenient to navigation. Please be patient and try to understand that many researchers before you have studied the subject. Trying to do something original before knowing what they found is seldom a good idea. J’espere que vous ne vous fachez pas avec ma franchise. Tout ce que veux c’est vous aider dans vos etudes et vous eviter des humiliations inutiles. Needless to say I did not take the advice of this person, and continued to research the internal workings of these Portolan Charts and Atlases. I suggest now that I am not the one who requires reconsidering their research, and certainly do not feel I am the one who will be humiliated. Anybody who thinks I am wrong write it up and post it so that all can read their research and criticisms, and they can explain fully just how a chart was developed using a magnetic compass and a declination which altered from 4 degrees in Iberia to 16 degrees in Alexandria. Thus let discussions start. I have asked this question many times, and received nil response; oh well. For anybody in doubt that I had previously read all of the texts mentioned I suggest a review of the Charts page on this website.